As evidenced below, Workplace Wellness COE’s workplace wellness solutions were conceptualized and developed around each of these dimensions. Organizational Supports: the first and foremost workplace wellness essential is senior leadership buy-in and support. Organizational leaders need to connect with the ‘Why’ of workplace wellness, they need to buy-in emotionally, be a visionary part of the process, become a voice for workplace wellness, and, ideally, lead by example. For small- to mid-sized businesses, organizational support and buy-in should be garnered from the business owner/senior management through visible support and active participation in workplace wellness initiatives. For larger organizations, C-Suite sign-off and participation is imperative for program success. 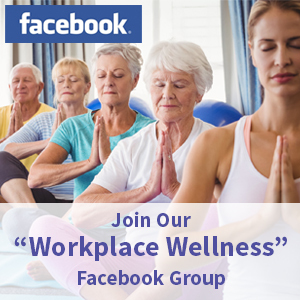 Workplace Wellness programs die on the vine without such support. It truly is the deal breaker! By example, Workplace Wellness COE Executive Wellness Coaching program supports executives in leading healthier and more productive lives which over time creates organic receptivity, support and momentum among C-suite and small business owners for organization-wide wellness development. Organizational supports for building a healthy workplace also include workplace wellness teams and Wellness Champion(s), incentive and employee recognition programs, competitive pay and benefits, and ongoing promotion of healthy workplace practices. 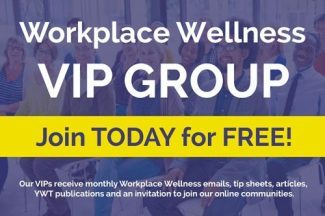 Healthy Workplace Programs and practices involving nutrition, physical activity, stress management, smoking cessation and disease management are foundational to a solid workplace wellness program. Workplace Wellness COE Wellness solutions builds supportive working relationships that, in turn, create positive and respectful workplace cultures. Supportive working relationships may be characterized as respectful and compassionate employee relationships, open, two-way communications among employees and management and a ready willingness to assist and support fellow employees in work and life. Supportive work cultures in turn facilitate co-creativity, partnership, innovation and team synergy. Workplace Wellness COE workplace wellness solutions inherently promote team synergy within organizations through its inclusive approach to workplace wellness design and delivery, Workplace Wellness COE’s Workplace Wellness Ambassador Certification program© being a key example. When organizations work toward team synergy, teams collaborate toward common goals and objectives across all initiatives from workplace wellness to client solutions. 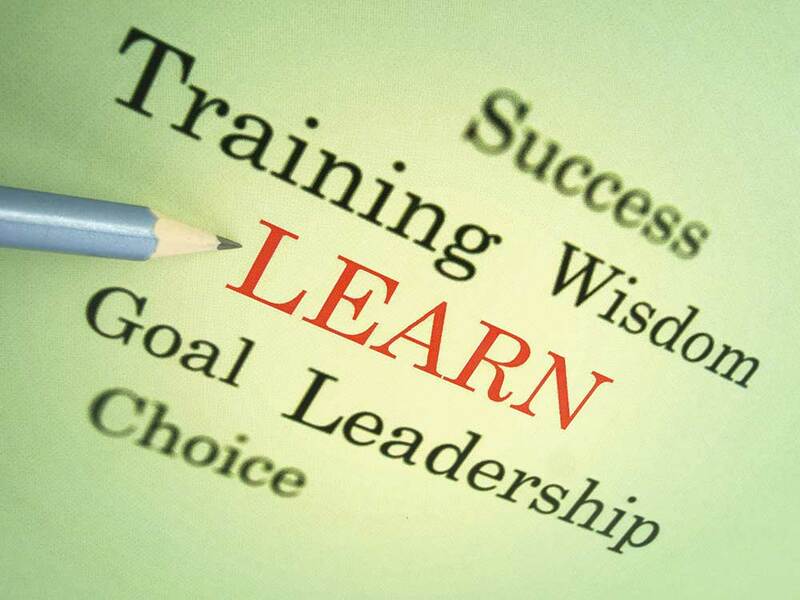 Knowledge sharing occurs, learning organizations are formed. There is an appreciation of cultural diversity and dynamic team leadership becomes the norm. Employee engagement is arguably the pinnacle benefit and desired outcome of strategic workplace wellness initiatives. Engaged employees perpetuate a culture of co-operation, collaboration, innovation and risk taking. They take ownership of corporate success, are actively involved and vested in corporate decision making, organizational growth and success. Interestingly, after this blog was completed, I received a copy of AON’s Canadian-based, 2011 Workplace Health Survey and with permission included a section of their survey findings that corroborates Workplace Wellness COE’s views and approach to creating healthy workplaces. 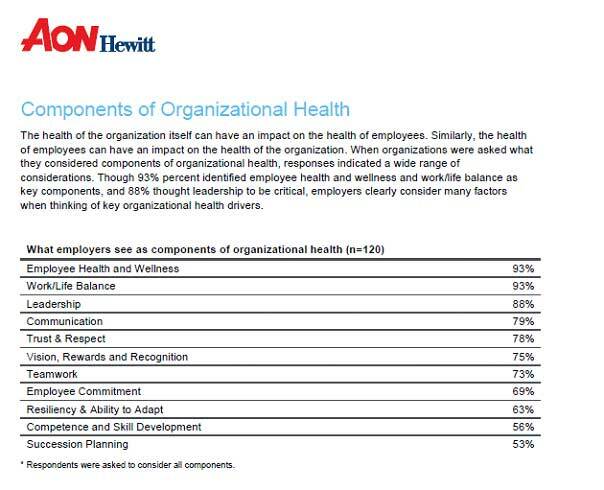 AON Hewitt, Workplace Health 2011 Survey, Toronto, Ontario. Used with permission.